We just saw a broadbased US Dollar sell off in the currency markets, most likely on positive Euro data and inflation comments from Eurozone and BOE officials. We were stopped out of our trade. .9900 looks like a nice level to take advantage of a short term, support play, but with US PPI and Consumer Confidence coming up, I’ll just sit back for now. With all of the data, this week is going to be pretty choppy as market movements have been data dependent in recent months. Look for shorter term trade ideas from me to take advantage of market volatility. USD/CAD dropped a couple hundred pips this morning as strong commodity demand has brought back risk appetites to the markets. Will it stop at .9950, where it has found support numerous times before, or will it finally break the range the pair has been trapped in for a month? Commodities (which make up almost half of Canada’s exports) have definitely been in favor on global demand, so we are seeing support in the commodity currencies such as the Loonie. The 200 pip drop is a very dramatic move, so I think we may see a bit of retracement at the previously tested support areas as shown on the chart. 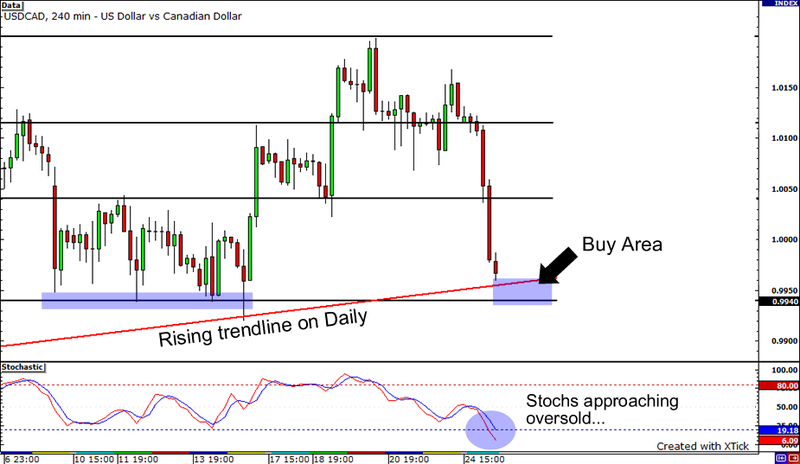 The red trend line is drawn from a daily chart and we can see stochastics showing an oversold condition. Two support lines inter crossing gives us good technical reasons that we may see buyers jump in once again.